AFS Connect advanced farming management system gives you instant access to information for every machine in your fleet - including machine location, diagnostics and fuel and engine stats. Use it to manage operator and equipment performance and monitor real-time data to make informed decisions that impact your bottom line. Learn more about the key features of AFS Connect by clicking below. Delivers guidance correction to a reliable sub-inch accuracy from year-to-year using AFS Connect hardware. Cellular RTK guidance correction signals alleviate problems associated with traditional radio delivered RTK such as line-of-sight issues, including hills, valleys, trees, buildings or other structures — extending your distance of travel from a cellular base while maintaining sub-inch accuracy. Seamless connectivity reduces application overlaps and skips, improves field efficiency and allows for more accurate placement of inputs, such as fertilizer and herbicides. This helps achieve repeatability — even in the most narrow rows — and keep tire tracks on the same path to reduce compaction. Pinpoints the exact location of each machine and through custom reports you can setup geofences, curfews and more. Allows you to view real-time machine parameters from a remote location. Monitor engine speed, oil temperature, coolant temperature and level, hydraulic oil temperature and pressure, fuel and more. Lets you view real-time equipment performance data, including; yield, moisture, singulation, target rates, rotor speed, engine speed and more. Helps you remotely transport AFS data easily to your home office or trusted adviser and upload prescriptions directly to your machine. Shows area worked, yield average, flow average, moisture average and more. It's a real-world scenario, but not a best-case one: The producer observes that often his machines spend time waiting in the field to unload or waiting for a fuel truck. It squanders valuable time from the limited windows that every producer experiences. "Time. That's the only thing you can't buy. Instead of me driving 20 miles one way to fix a problem and 20 miles back to get back to what I was doing, I'll look it up in three minutes on an iPad or computer and say, 'Well, this is your problem,' and it's done." AFS Connect from Case IH provides you with up to 30 minutes of Live Time streaming access to your equipment. So you can see what's happening in your equipment as it happens. AFS Connect also has a one-minute data refresh rate - the fastest in the industry. It continuously provides you with updates on equipment location and performance to any Web-enabled device. Additionally, with AFS Connect, you can send messages through your Web portal to the system to stay in constant contact with the people operating your equipment. It's bold. It's crisp. It's easy to read. The AFS Connect dashboard provides a clear display of machine health parameters such as engine speed, hydraulics, oil temperature, fuel level and more. "Just simplicity - that's the key to efficiency. The more user-friendly we make the technology, the better and the more efficient everyone will be able to be." All of these features in a format that's easy to understand, so you can manage your operation more efficiently than ever before. You can't get that with any other system. AFS Connect lets you monitor anything with power, from field machines to road vehicles. It can help you save time, save fuel, cut costs and improve overall efficiency. And you can access it from wherever you're sitting - from the kitchen table to a pickup truck. "Collecting the data, that's helpful. To be able to look at each machine and know how many hours are on it and when services are coming instead of depending on somebody to physically keep up with that...that would be really useful." It works on just about any piece of equipment from combines to trucks, even outside the Case IH product line. This provides you with a unifying system to monitor, control and manage your operation and data on mixed fleets. AFS Connect is backed by our 24/7/365 support network, which is always available for assistance calls with equipment. Whether it's midday or midnight, we're ready to help. 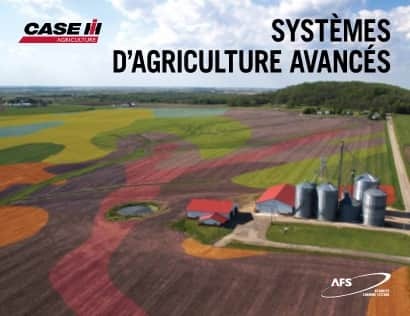 Only AFS Connect lets you decide who sees your agronomic information. So, not only do you control your equipment but you also control it's data. Some telematics solutions require producers to share data collected on their farm, or they offer an "opt-out" clause buried in the fine print. The Case IH Term of Use are fully transparent. "You are the owner of the agronomic data generated from the assets. CNH Industrial will only share agronomic data with third parties in order to provide the services YOU subscribe to." Can I exchange data with other systems? Can I change brands and keep my data? Case IH Answer: As a founding member of OADA,* Case IH adheres to the organization’s standards of data security, privacy and interoperability for the entire agriculture industry. These standards make it easy to analyze and share mixed-fleet data and to keep your fleet and maintenance management system up to date and interconnected as your fleet changes. Not every equipment manufacturer or precision farming technology supplier is an OADA member; ask before you make a telematics technology investment decision. Who can see my data on my farm, at my dealership and at your company? Case IH Answer: Some permissions are predefined by the system, but most are determined by the producer. Generally, access is restricted to what is needed to support a farmer. When you set up your system, you can assign different types of user profiles based on your preferences: Customer Manager (owner), Customer Operator, Support/Hotline. Case IH Answer: Select machine data is collectively analyzed to drive quality improvements. No one at Case IH or your dealership has access to your agronomic data. How long can data remain on your server? Case IH Answer: Data is saved in the cloud for AFS Connect™ for 18 months. If desired, longer-term archival storage can be performed on your local drive. What happens to my data when I sell my equipment? Case IH Answer: Your information belongs to you, not the machine. Your data stays with you and your modem. Case IH Answer: No. We will only share agronomic data with third parties to provide the services to which YOU subscribe. If I opt not to share my agronomic data with you, will I still be able to see and use my own data in your telematics system? *Open Ag Data Alliance (OADA) is an organization designed to bring security and privacy to agricultural data. The evolution of precision technologies has created the need for better data access methods and raised the importance of customer-controlled and customer-owned data. Case IH has established guidelines and principles related to data ownership and access to address these needs. All data generated or entered by the farmer, his/her employees or his/her machines is controlled by that farmer, while using open industry standards for optional secure data sharing. This allows producers to realize the full value of their data and the right to select what can be shared and with whom. The systems are designed to be secure in maintaining or transmitting information without compromising the producer’s privacy or sensitive information. Should they choose, farmers are able to share data with Case IH or third parties through a system that incorporates technologies that allow and require producers to identify which data may be shared. This reduces complexity by providing a platform for farmers to seamlessly and simply leverage the data they produce. Case IH will only share agronomic data with third parties to provide the services to which the producer subscribes. Data systems will comply with industry standards for data communications, yet remain flexible to change as the needs and access for agricultural data expand and evolve. Permissions are predefined by the system, but most are determined by the producer. Generally, access is restricted to what is needed to support a farmer. When a producer sets up his/her system, he/she can assign different types of user profiles: Customer Manager (owner), Customer Operator, Support/Hotline. Service and support for all of your AFS products, while also coordinating with your Case IH AFS Certified Dealer. You'll talk with an AFS support engineer who is 100% dedicated to keeping you rolling in the field. Contact the AFS Support Center at 1-855-4AFS-HELP (1-855-423-7435). Case IH AFS Certified Dealers have a trained AFS sales specialist on staff to help you optimize your farm. Find a dealer near you. Keep on top of the latest Case IH product information, form show reports and industry news. 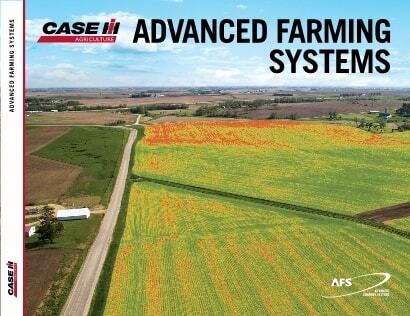 ​View all Case IH AFS products.